1 What are the requirements for applying to AdSense? 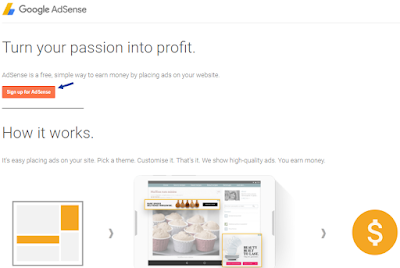 1.1.1 How to Reapply to AdSense program? Having a quality blog on blogger platform allows to sign up for Google AdSense account to make revenue by showing ads on your blog. 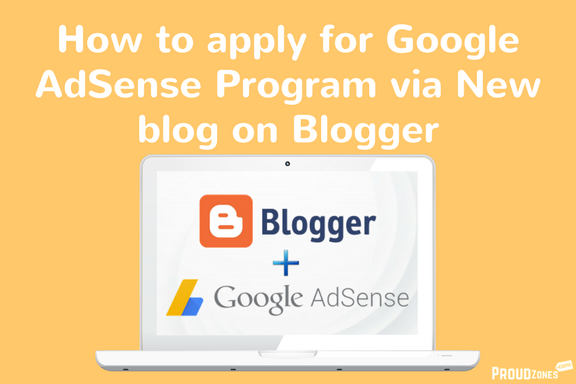 As we know all that Blogger and AdSense, both are owned by the Google company, thus, it is easier to apply for AdSense via blogger. Even by default, blogger has an Earning Section, which can be seen from your dashboard. 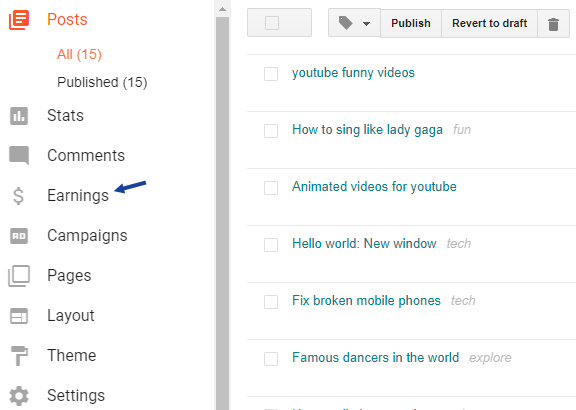 So, today in this tutorial, we will learn how to apply to Adsense advertising programme from your new blogger account. What are the requirements for applying to AdSense? Below are some major requirements that you must fulfill before applying for AdSense. Your blog should be fully published, remember blog under construction will be rejected. Your blog should be minimum 6 months old for India, Nepal, Bangladesh users as per AdSense Guidelines. There should be no illegal or adult contents on your site, or else your application will be rejected. There are also chances that Google might panelized your blog due to illegal activity. Your blog should have original contents, created by you. Duplicate, copied contents, copyrighted images will be rejected. Before applying to AdSense, make sure you have a minimum number of posts on your blog. Consider reading the Official AdSense Guidelines for publishers for more conditions before submitting your application. 1. Login to your blogger dashboard and click on “Earnings”. 2. Click on “Sign up for AdSense” button. 3. Now you will be redirected to a new page. Here you need to confirm your Gmail address. Sign in using your current email ID. Once you’re signed in, click “Yes” to continue with your current email. 4. Select your “primary language” and click on “Accept association”. 5. Now you will be redirected to your blogger Earnings page. Here you need to allow Adsense to connect your blog. Click on Show ads on blog > Display ads below my posts and in the sidebar > Save settings. Congratulations! You have successfully applied to Adsense program using your blog. Read: Secrets to getting an approved Google Adsense & why your application was Rejected. Note: Google normally replies within 3 business days whether your application is been approved or rejected. In some cases, it may take up to 2 – 3 months to reply. But, no can exactly estimate the time period of the approval process. You’ll be notified by the Adsense team, whether you are qualified or not! If not, then, they will highlight the issue in the reply email. Or you can log in to your Adsense and check the reasons for rejection! Understand the issue and work on your site, fix the terms violation and reapply for Adsense. Here are the necessary steps to reapply for Adsense. How to Reapply to AdSense program? 1. Login to your Adsense account and open the homepage. 3. 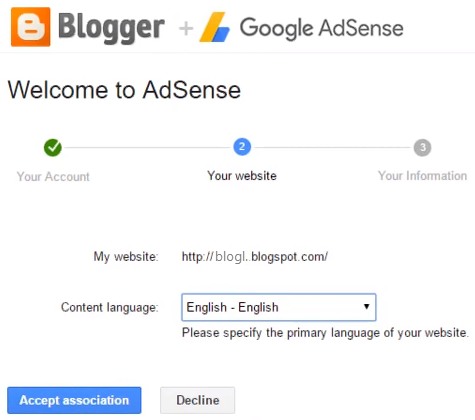 Now, copy the Adsense code and log in to your blogger account. 4. Go to the theme section and click on Edit HTML. 5. Find for <head> and paste the copied Adsense under </head> tag, and press on save. 6. Go back to the Adsense dashboard and click on, “I have pasted the code on my site” and you are done! You can also watch this video tutorial to learn more about connecting your blogger site to Google Adsense. I remember making a couple of mistakes when I first signed up. But hopefully, if you follow this guide, you won’t make the same mistakes as I did. If your application gets rejected again, no worries! Understand the reasons for rejection and fix those issues to reapply again! If you get rejected for several times, then you may select other Adsense alternative advertising networks, for monetizing your site. At last, here are a few handpick contents that you should consider reading up next.